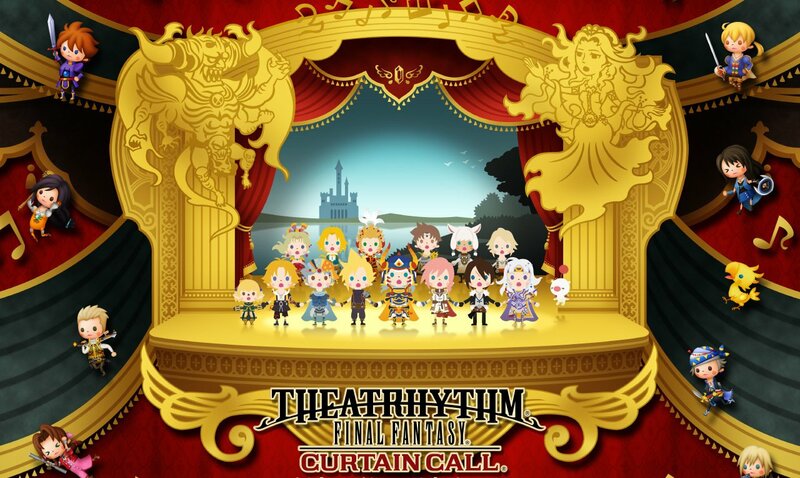 Welcome to the official discussion thread for Theatrhythm Final Fantasy: Curtain Call on the 3DS! To start, please add this game to your log, add it to your collection (if applicable), and (when you are ready) rate it using the link above! The sequel to the first Final Fantasy rhythm/music game, Curtain Call improves over the original in every way with new gameplay modes, over 200 songs, and 60+ characters. Featuring music that reaches across the entire Final Fantasy franchise (yes, it includes Mystic Quest and even Crystal Chronicles). You tap along on the 3DS touch screen (or face buttons, if you prefer...or a hybrid mix of the two control styles) to the classic tunes as the highly stylized, chibi-like characters walk, battle and venture through the wide multiverse of Final Fantasy. Over 20 titles are represented in this game, featuring the incredible music, amazing visuals, and even the role-playing elements that made the franchise the behemoth it is today. This is the ultimate music package for gamers - now get to playing some jams, you spoony bards! This game is excellent--a great expansion/upgrade from the first. The new Quest Medley mode is a solid improvement on the Chaos Shrine from the first one, and I dig the new way to unlock characters. If you like FF music and rhythm games, you can't go wrong with this. The only thing holding it back for me is that there's so much music from games I've never played, but eh. Oh, also I think it's dumb how they have doubles of some characters (Tifa #2, Lightning #2, etc) just to represent certain games (and a movie in Tifa's case). Otherwise, Curtain Call is really good. Yeah, it is really strange how they included 'Advent Children' as part of the package. I mean, it's cool fan service for the fanboys of Final Fantasy VII (a group I'm admittedly probably a part of) but...that's a movie. It's not a GAME, lol! Oh well, whatever. I'm not entirely familiar with all the music either, but I actually find that as a positive. I'm really enjoying hearing and learning about the music from games I've never played. The most surprising? The music from Mystic Quest (SNES). Those tunes are ROCKIN'. That thing on Ultimate is so fun to play! Yeah, this game is crazy good. I've already played it more than I have the original...! By the way, did you guys already download the free DLC? If not, get on it - it'll cost money after September 30th! Did they add tons more III/"VI" stuff? The other game didn't have much, right? Is EVERYTHING there? Surely it can't have EVERYTHING.. I think Theatrhythm 1 had a decent amount of FF3 in it. In fact, the representation for all the games in the series to that point (1 through 13) were all more or less equal, with FF2, 3, 7 and 13 seemingly getting a little bit of a boost. In this new one, in addition to playable Terra and Locke from the first one, there are now two more playable characters from that game (Celes and Edgar) and a few more songs. And one of the menu songs is a remix of Locke's theme. All in all though, if that's the only game in the series you like, there's not an abnormal amount of content from it or anything. That said, I really only like FFIV, VI, VII and IX and I'm still enjoying the game a lot. FF7 is pretty over-represented, as is FF13, but what're you gonna do? I tried the demo, and it looks to have fixed two of my big complaints about the original game. The new button controls work well and should have been in the original, it took me a bit to adjust to the timing since I was still compensating for the slight lag of touch input, but once I did then it was definitely much easier to tackle the two Ultimate scores with buttons. The second thing is that it seems the Stoic bonus is no more, this bonus pretty much made party customisation pointless so it's nice I can still mess around with that stuff and get the highest possible score. I've already sold the original game, and this version just makes the original look even more like a scam. I'm still going to wait for a sale on this game though, since at best it still seems like a $10 iPhone game. What the heck? Why would you say that? I think both Theatrhythms are great and have a ton of gameplay and value in them. Just because something has DLC doesn't make it a scam. I agree that the Stoic Bonus was a dumb idea at least. @TriforceBun That's just one reason but it also felt a bit cheaply made. Weak graphics, no remixed music, and forced touchscreen input with simple gameplay that doesn't change much with the tune. Plus, $2 for just one DLC song is way overpriced. The game felt more like a $10 eShop game than a full retail title, I've played $10 games with better quality, but that's just me. This new one at least comes close to feeling more like a worthy retail title. Wow, really? What game is that? I wanna check it out! Isn't it 99 cents for a song? @VofEscaflowne Ah, you're right, my mistake. I don't know why I thought they were $1.99, I guess I'm thinking about a different Square game. Still, when the original game has around 70 tunes and this new game has over 200, that's still a bit overpriced since those games would be $70 and $200 if they were DLC. @GameDadGrant It isn't a music game, but I feel Dillon's Rolling Western is a better game in terms of quality. I did try the demo for that HarmoKnight game and it might be better quality as well, I'll probably check it out sometime, it looked interesting enough. I meant the iPhone game. Eh I just buy the ones that I want which was 2 for the first game. For the 221 songs that this sequel includes, I'm more than happy with it. I might still buy a few cause really, I've played this game more than most games this year in a single week. Yeah, there's no way I'm dropping money on every DLC song that comes down the pipeline--I just tend to nab a few from FF6 and call it a day. A couple bucks for some of my favorite songs seems fair to me, especially when there's still lots to do in these games. In fact, I just learned you can level past Lv 99, in a way. You can reset a character's level to boost your CP, making them gradually stronger over time! This is great news for me, because it means I can just focus on my four FF6 fellows forever and never bother with those other chumps. There's more than enough FF7 representation in this game already...three different "games" (including the movie) and TEN (!!) characters? Pah! But no, I guess that's cool. I mean, who needs Sabin when you can have Cloud #2 and Tifa #2? @TriforceBun Yeah, it's odd how much obsession Sqaure seems to have with FFVII, and yet they still haven't remade the game. I wonder what they're waiting for on that one, seems like it'd be a guaranteed instant hit. @GameDadGrant Ah, that wasn't the post you referenced. In that case, any phone game where you just tap the screen, probably. ................oooooooookay. I thought maybe you would have a definitive answer, since you appeared to be speaking with authority on the subject. Oh well. Incidentally, the iOS version of Theatrhythm is free to download. I wonder how many songs are available with the initial "purchase." It would be rather daring of Square to make the player buy each and every song they wanted to have. But maybe that would be preferable to some people. Maybe? @GameDadGrant A definitive answer to what? I never made any direct comparisons, just said that the gameplay in the original is similar to tapping games found on the iPhone. I don't play phone games but it sounds like the kinds of games people talk about. Yeah, when I was looking up the prices for the DLC on 3DS then I saw that there was a phone version. I'm not sure how many tunes are in the free download, but I've heard that characters are also sold separately, and buying all characters and tunes would cost around $150. Shockingly, the phone version is even more expensive than the 3DS version! You said it seemed like a $10 phone game, so I thought you might have an example of one. I suppose I guessed wrong. My mistake. In other news, yeah, I checked out the iOS version of the original Theatrhythm, and you get a whole TWO songs with your free download. (which is how much you get for the 3DS demo!) The rest you have to purchase at $0.99 a pop. Characters are purchased separately, too. Crazy! Yeah, you're totally right, the iOS version could end up costing far, FAR more than the 3DS version if someone wanted all of the content. ANYWAY. Back to the topic at hand. Curtain Call. I recently unlocked online multiplayer...anyone available for some online music battles? Anyone? Anyone? .......anyone? Yea, this game does not seem like a $10 iPhone game, that's just silly. That's not to say I'll personally pay full price for it, but anyone who did would be getting their money's worth clearly.